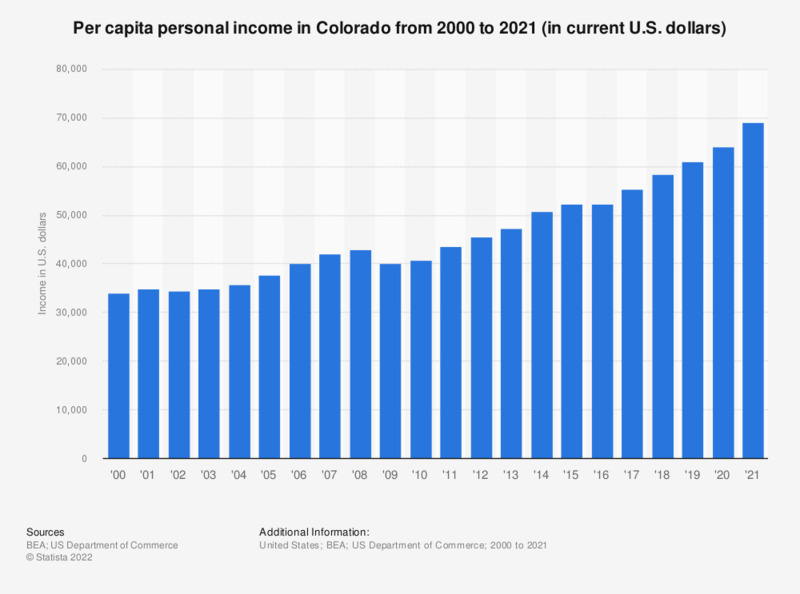 This statistic shows the per capita personal income in Colorado from 2000 to 2018. In 2018, the per capita personal income in Colorado was 56,846 U.S. dollars. Personal income is the income that is received by persons from all sources. Personal income is the income that is received by persons from all sources. It is calculated as the sum of wage and salary disbursements, supplements to wages and salaries, proprietors' income with inventory valuation and capital consumption adjustments, rental income of persons with capital consumption adjustment, personal dividend income, personal interest income, and personal current transfer receipts, less contributions for government social insurance. This measure of income is calculated as the personal income of the residents of a given area divided by the resident population of the area. In computing per capita personal income, BEA uses the Census Bureau's annual midyear population estimates. All dollar estimates are in current dollars (not adjusted for inflation). Statistics on "Christianity in the U.S. part I"
What is your religious preference: Protestant, Roman Catholic, Jewish, another religion, or no religion?